High-level automated road transport, based on autonomous and cooperative systems, will significantly contribute to meeting the EU objective of reconciling growing mobility needs with more efficient transport operations, lower environmental impacts and increased road safety. ICT (Information and Communication Technology) infrastructure will play an important role for facilitating cooperative and automated driving. To study ICT for infrastructure-based cooperative and automated driving, 16 use cases were defined addressing management of a range of different types of situations. These use cases are listed and categorised in the table below. The following sections present some recent results of this research study, focusing on vehicle and infrastructure automation, and on enabling technologies, such as V2X communication for automated driving, ADAS (Advanced Driver Assistance Systems) functions for Vulnerable Road Users (VRUs) and driver protection, and High Definition (HD) Maps. For the research, a high-level simulation architecture was developed. The main actors involved are the cooperative vehicle and cooperative intersection. The figure above-left also shows the actors outside the boundaries of the architecture that interact with the system. These are non-cooperative vehicles and VRUs that only interact in traditional ways with the system. Cooperative priority vehicles are vehicles that request priority in a traditional way from a functional perspective (using check-in and check-out points), but use new cooperative technology as a communication channel for this. The Traffic Management Centre (TMC) is an external actor that may change policy parameters in the intersections and coordinates green waves over multiple intersections. The road authority or traffic management software can trigger this. A simulation architecture (see the figure above-right) is developed by keeping maximal compatibility and re-use of real-world systems, while enabling retrieving sensor information from the simulation environment and changing states of traffic lights and vehicles according to the actuator outputs. Components that are identical to the real-world implementation are marked in grey, simulation specific components are marked in orange and adapted elements are marked in grey/orange stripes. The interfaces to the grey elements should stay the same. Both the vehicle and the intersection have a shared Logical Data Model (LDM), as the communication units have been removed, saving a lot of computational time for encoding and decoding messages. Systems connected to this LDM will not notice a difference, as the same data is still present in the same format. 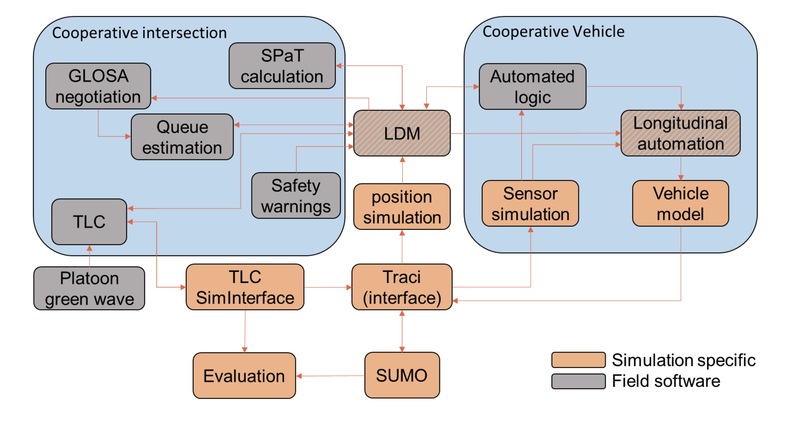 The figure below shows the platooning state machine for fully automated cooperative vehicles which is part of the developed multi-layer vehicle automation concept. This multi-layer concept splits the automation into two levels. The trajectory planning ensures the vehicle drives an optimal path within the lane on a short horizon. The tactical level takes input from Vehicle to Vehicle or Infrastructure (V2X) communication and platoon algorithms to control the vehicle on a higher level. This is where platooning, lane changes and optimal speed for approaching an intersection are the main targets. For platooning a detailed algorithm based on a state-machine and supported by the new message sets was developed. Cooperative environment perception and of cooperative trajectory planning have been developed. 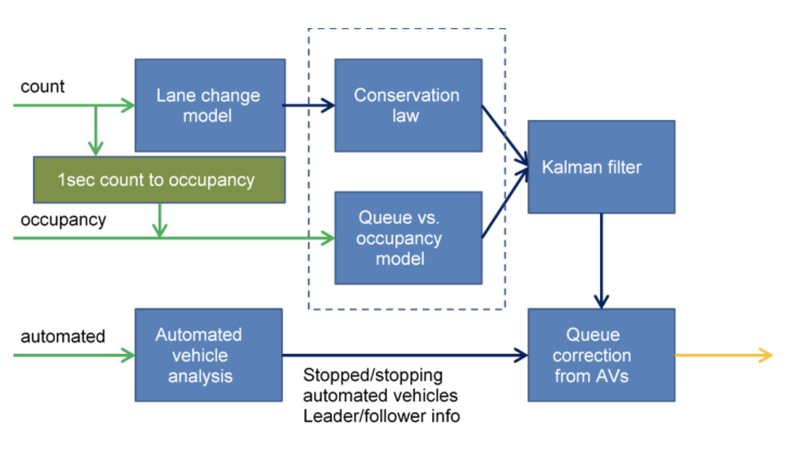 The goal of cooperative environment perception for the Highly Automated Driving (HAD) vehicle is improving the range of the view of its environment. The environment model is composed of non-moving obstacles and moving road users. The cooperative aspect means that in addition to the on-board LIDAR (Light Detection And Ranging), Radar and Camera sensors, CAM (Cooperative Awareness Message) and CPM (Collective Perception Message) are considered. The main idea of cooperative trajectory planning, is that inputs received via V2X by other traffic participants and infrastructure are also considered in the planning algorithms. Results of cooperative trajectory planning are highlighted in the figures below. Simpla has been developed, and allows users to simulate automated vehicles in SUMO (Simulation of Urban MObility). The extended Local Dynamic Map (LDM) enables the exchange of new essential information elements for the use cases and the position simulation adds random noise to GPS (Global Positioning System) measurements from simulation for realistic queue modelling simulations. The research in queue modelling showed that data fusion of information from traditional detectors and automated vehicles resulted in up to 40 percent reduction for the average error of the queue length estimation. The largest benefits were visible for high traffic volumes, because the chance of receiving vehicle information increases. Having better queue model information results in both more efficient traffic control and more accurate speed advice for automated vehicles. Another important factor for speed advice is the predictability of the control plan. A new stabilisation cost function was added to the adaptive control algorithm, which resulted in 25 per cent reduction of average prediction error, while maintaining similar traffic efficiency. More advanced parameters were added to combat specific side effects, like the prediction stagnating at a certain value due to a green extension. This resulted in a small further improvement, but most notably in a solution for the stagnation problem. Actuated control has also been conducted. It is the most common form of traffic control in Europe, but is also known to be very unpredictable due to the ad-hoc decisions. Solutions have been developed to provide measurements for the reliability of the forecast. With priority schemes for automated vehicle platoons, negotiations elements were added that can take several parameters into account. Both the actuated and adaptive control strategies show automatic formation of green waves when platoons progress through the network and controllers get connected to each other. 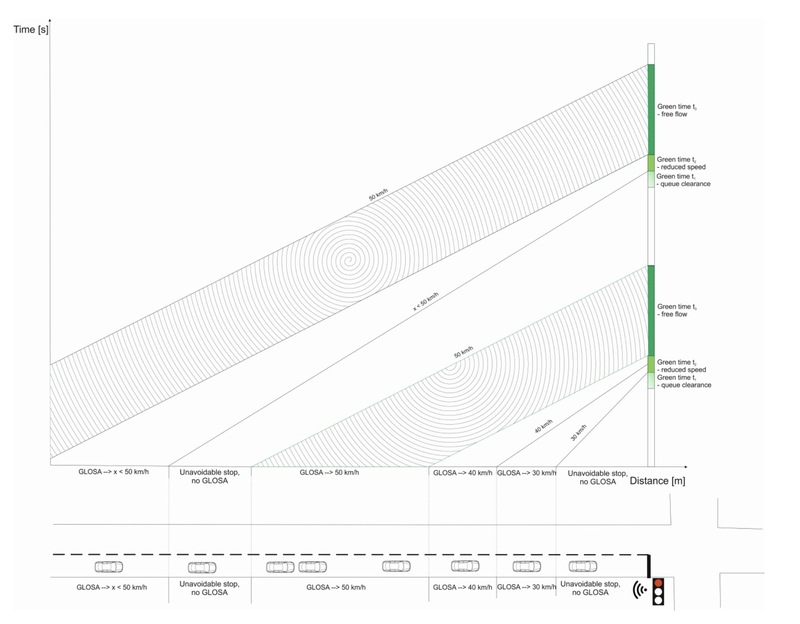 The figure below shows actuated traffic control with GLOSA (Green Light Optimal Speed Advisory). Scheduling and signal timing strategy prototype has developed. Three demonstrations have been conducted: 1) improved countdown stability of the adaptive traffic control algorithm; 2) deployment of the external queue model interface and the response of the developed control algorithm in Helmond; and 3) AGLOSA (Agent-based Green Light Optimal Speed Advisory) system, directly running on the traffic control hardware on the street (with the algorithm implemented in SUMO). To enable automated driving solutions, V2X communication schemes and message sets have been developed. These include several contributions: for the cooperative infrastructure, an I2V Lane Change Advisory service and a dedicated profiling of the SPaT (Signal Phase and Time) and MAP (topology) for lane-specific GLOSA were developed. For the cooperative automated vehicles, extensions of standard CAM (Cooperative Awareness Message) messages have been designed to allow interaction with cooperative intersections and to support management and control of platoons. Finally, the currently under standardization Collective Perception service has been adapted to the needs to support the applications of cooperative and automated vehicles aimed at increasing the safety of VRUs and vehicle drivers. The developed schemes are backward compatible as required by the car industry and to foster their future deployment. They are provided in terms of ASN.1 (Abstract Syntax Notation One) definitions and detailed message data specifications that can be openly accessed. The aforementioned communication schemes have been tested in small test benches aimed at evaluating the technical functionality of the developed solutions from a communication point of view, and hence their suitability for integration in infrastructure and vehicle prototypes. Research has been done in the definition of the concept for ADAS inclusion in more generic automated driving frameworks. First, it was jointly agreed not to consider ADAS solutions based on retrofitting VRUs with C-ITS technology to let them cooperatively advertise their presence. 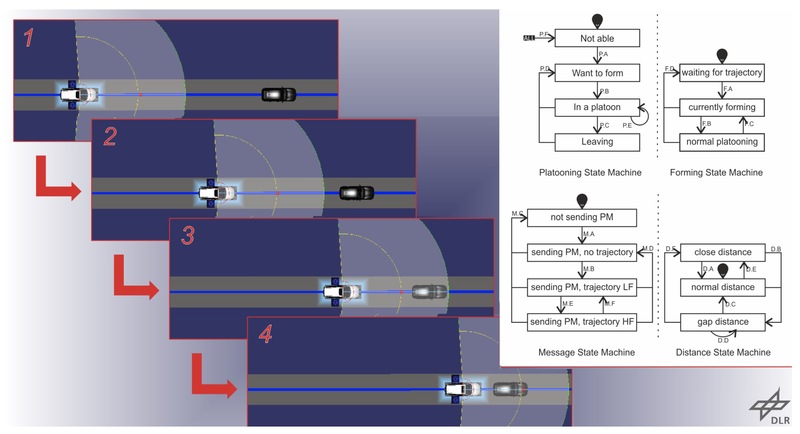 Due to positioning limitations of these retrofitting solutions, the resulting ADAS would not be reliable and create uncertainty in the automated driving algorithms’ reactions. Second, it was agreed that ADAS functions in the context of automated driving cannot be treated as separate functions but have to be integrated in the overall algorithms for environmental perception and path planning. For example, ADAS functions relying on cooperative sensing (collective perception) can be seen as complementing extensions of functions relying on on-board sensors. System reactions will be directly influencing the path planning (e.g. slow down and braking) when the confidence of the advertised detected object is good enough to justify them, or when the advertised object was not yet present in the environmental perception module databases because no local sensor has detected it yet. An iterative evaluation process has been run through which a suitable level of HD map precision has been identified to support the automated driving scenarios. Commercially available HD map databases of the designated test sites (provided by TomTom) have been considered. Based on these databases, the requirements for vehicle automation in terms of HD map format extensions have been identified. In particular, the need of a "corridor" representation for road intersections has been detected as a pair of "virtual boundary lines" that connect the boundary lane markings of inbound lanes to boundary lane markings of outbound lanes. This information is necessary for automated software system implementations because it indicates the boundaries to respect to perform a given intersection-crossing manoeuvre without invading zones where conflicting situations with other road users can occur. With the extensions embedded in the reference HD maps, an evaluation of the impact of the resulting HD map accuracy on the automated vehicle trajectory and control calculation has been performed. By comparing the results obtained with the new extended format with those obtained with the original format, this evaluation demonstrates that the resulting extended HD maps are suitable for automations as they permit trajectory calculation with sufficient quality. As complementary activity, a thorough investigation of the state of the art on HD map standardization is performed. This investigation permits identifying the minimum set of generic requirements for HD maps, as well as a comparison with the adopted HD map format and extensions. 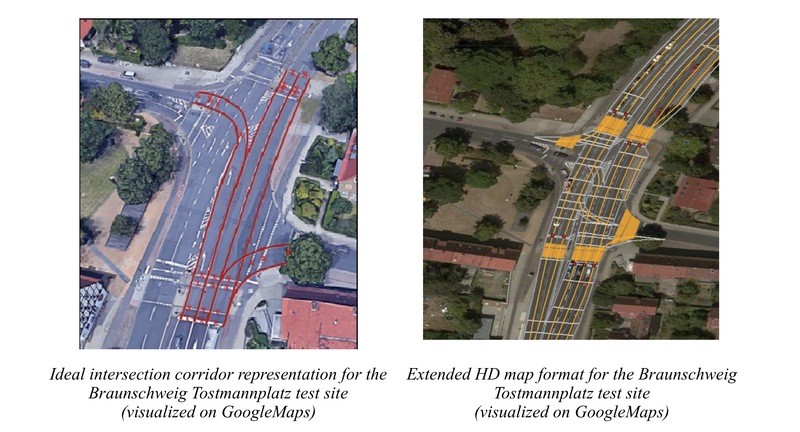 As a result of this comparison, the extensions in terms of intersection corridor approach are identified to be a possible input for standardization. Approaches for enhancing the intelligent road transport network and cooperative systems for highly automated vehicles are presented, from the perspectives of vehicle, infrastructure and emerging technologies. The development of V2X communication is essential for cooperative and automated driving based on ICT infrastructure. An impact assessment will be conducted, including technical impacts (e.g. meeting of the technical requirements), functional impacts (e.g. covering the needed functionality), impact analysis (e.g. evaluating the impact of platoon organisation, negotiation algorithms, penetration rate of automated vehicles and others) and user impacts (e.g. addressing the acceptance and compliance of drivers and citizens of the use cases). The article presents some results of the EU-funded project MAVEN (Managing Automated Vehicles Enhances Network), funded under Horizon 2020 Research and Innovation Programme. Grant Agreement No 690727.